Why go for a trip to the zoo, when you can bring the animals home with our cute, bright, colourful and quite charming Farm Yard bouncy castle. Featuring some stunning graphics including a pig, fox, chicken and chick - this bouncy is sure to be loved by all children and even adults. The bouncy castle is 12ft wide and 15ft in length which means it'll fit into most average sized gardens. We recommend looking at the Required Dimensions section and to always measure up before booking. 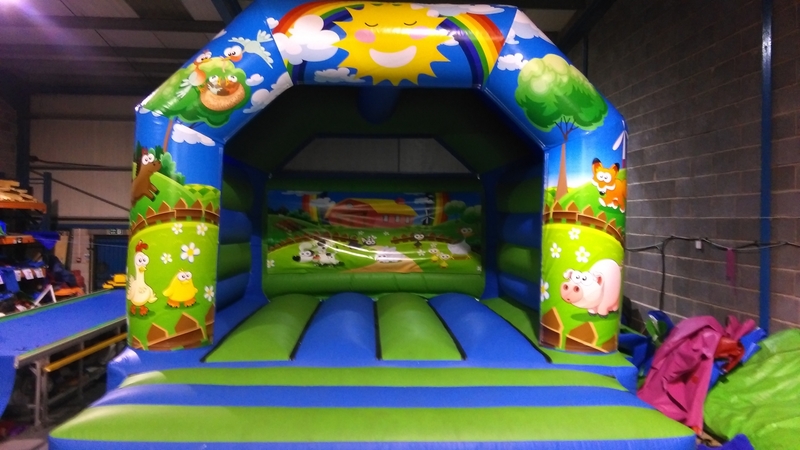 We believe this Farm Animals bouncy castle would be a great addition to any child's birthday party or even a christening. It's unisex making it a great feature for all ages and gender. MJ Castles are one of the leading inflatable hire companies within the North West. We don't stop at bouncy castles, we also offer a wide range of services from fun foods such as Candy Floss and Popcorn right through to mega inflatable slides and obstacle courses. Booking with us couldn't be easier with our incredible Live Diary recently launched. You can check your date above, place your booking and it'll immediately stop anyone else from grabbing the same date. So be quick, don't hang around, book with us today and we'll see you on the day!